This machine is designed for higher production and clear printing on papers. It prints using photo polymers stereos (2.8 mm and 4.8mm) and water based inks. the Anilox and rubber rollers helps in optimum ink transfer ensuring clear and sharp printing result. This heavy duty machine is available in Single/Double/Three color. 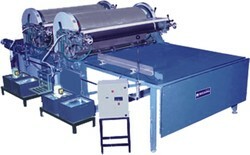 This machine is used for printing (single & Double colour ) on kraft paper. Extra heavy duty gear train with oil dip arrangement. 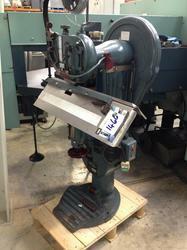 Extra heavy duty feeding table with feeding measures to ensure the proper feeding of board & paper. pulley to ensure the different speeds for different types of printing jobs. Ink tray is provided with inflow and outflow pipe lines made from special S.S.304 steel. 65"x75" 2.0 1600 84" 70"x85"
65"x85" 2.0 1800 88" 70"x95"
65"x95" 3.0 2000 92" 70"x105"
65"105" 3.0 2600 95" 70"x115"
Rotary Die Cutting Machine, its prints in short run jobs like business cards, customize playing cards , different shape invitation cards , tags and much more.